An Alchemy of Masques and Shadows turned out to an incredible surprise and one of the most engrossing reads I’ve had in a long time. In truth though, I hadn’t known what to make of the novel’s description when it first crossed my path. Its story’s scattered allusions initially prompted me to approach this one with a wariness I usually reserve for unknown quantities, but ultimately this mishmash of genre elements ended up being one of my favorite aspects of the book. There seems to be something for everyone, whether it’s science fiction, fantasy, historicals, steampunk or action and adventure that tickles your fancy. The story predominantly follows two characters: Jean-Claude, a stouthearted and valiant musketeer who must nonetheless act the drunken fool in order to protect Princess Isabelle, who hails from a powerful family of sorcerers despite possessing no magical aptitude of her own. Their fates first collided on the day of Isabelle’s birth, when the discovery of her congenitally deformed hand almost led her to be killed on the spot. Only through Jean-Claude’s intervention was her life spared, and from that moment on, the musketeer became something of a surrogate parent for the princess. As Isabelle grew up, her real father was cold and cruel towards her, disappointed in her disability and lack of magic. By trying to force her powers to manifest, he ended up destroying the mind of Isabelle’s best friend Marie, who became a “bloodshadow” after his traumatic magical assault on her psyche. Nevertheless, Isabelle found other ways to flourish, finding joy in secretly studying science and mathematics, two fields that are forbidden to women. She has even conducted her own research, publishing works under a male pseudonym. The only one who knows about this is Jean-Claude, who has looked out for Isabelle for years, making sure she is well-protected from those who see her deformity as proof that she is evil, or cursed. Jean-Claude’s job is about to get more complicated, however, when one day a half-human-half-clockwork messenger arrives with a missive from the Kingdom of Aragoth, whose Prince Julio has asked for Isabelle’s hand in marriage. Not only are the politics behind the arrangement messy, with a high threat of assassination attempts and other dangers, things in Aragoth are also very different from Jean-Claude and Isabelle’s home of the Isle del Zephyrs in l’Empire Céleste. Instead of using blood-based systems of magic, the sorcerers of Aragoth are Glasswalkers who can pass in and out of mirrors. Musketeers, Bloodshadows, clockwork cyborgs, Glasswalkers, airships and floating islands…is there anything this book doesn’t have? And as if that wasn’t enough, in the middle of all this is also a disorienting jumble of court intrigue and deadly politics. At certain points, this avalanche of information almost got to be too confusing, too much to take. And yet, just before my brain could short out like an overloaded circuit, Craddock started bringing it all together. Massive in scope and imagination, the world of The Risen Kingdoms became more immersive and real to me the longer I stayed in it. As evidenced from some of the naming conventions, the author draws a lot of inspiration from European history, but most of everything in this story is completely fresh and new. Also, I can’t tell you what a breath of fresh air it is to read a book where the heroine actually SHOWS readers how smart, strong and capable she is through her actions, as opposed to having the text TELL us again and again—which is never as effective as authors might think. A lot of debuts tend to fall into this trap, but I’m glad this book managed to employ “Show, Don’t Tell” by allowing us to develop a connection to Isabelle through experiencing her actions, words, and feelings instead of resorting to unwieldy exposition. To wit, she stood out to me without the narrative having to idealize her character or use any “Chosen One” clichés, not to mention Isabelle being an overall worthy protagonist also allowed me to sympathize with Jean-Claude’s fierce loyalty towards her. She’s someone who earns the respect and admiration of those around her, and this in turn made it easier for me to root for her too. 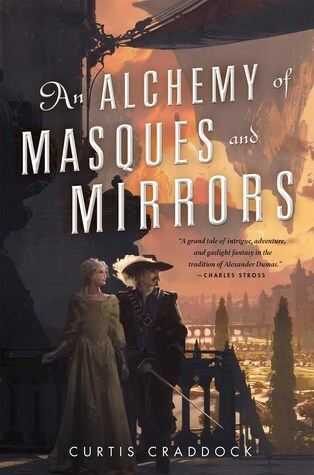 Evocative and creatively imagined, An Alchemy of Masques and Mirrors is a gorgeously written debut encompassing a splendid mix of speculative genre elements. Lovable characters made this one a joy to read, not to mention my delight at how almost every page would bring something new and awe-inspiring about the world to the table. If you haven’t made reading this a priority yet, you should get on that right away. As a series opener, this book made a huge impression on me, and I can’t wait to see where the story will go next. One of the best surprises this summer! Wow! I like science fiction, fantasy, historical, steampunk, AND action, I guess this one is really really one for me. 😀 And it’s a debut novel? That’s amazing. I’d not heard of the book before today but I will check it out. I’m so glad you enjoyed it! Yeah, I hadn’t heard much about it in the months leading up to release, but the reviews so far have been largely positive. I’m glad, because the book and author deserve more attention. Definitely! I’m glad everyone seems to be enjoying it too! I had no interest in this book before reading this review. It definitely has my attention now. I’m glad! And yeah, I heard little about this book in the months up to its release. It honestly came out of nowhere and swept me off my feet. I can’t wait to read this now – I have a copy and so it’s going to be my next book. Just saw Tammy’s glowing review too. I’ve only skimmed this but I will return. “Surprise” is exactly how I reacted. I just wasn’t expecting this to be so good, and so many hidden surprises, right? I can’t wait for the next book! Hooray, I’m so glad to hear you loved this one too! I was completely taken by surprise by the story — I also thought that there might be a romantic angle between Isabelle and Jean-Claude based on the synopsis, but I’m really relieved it went a different way. It’s been ages since I’ve read such a strong series debut! I agree, even though the actual idea of a romance between Isabelle and Jean-Claude wouldn’t have bothered me at all, I loved the specific relationship that ended up developing between then, and I wouldn’t have wanted it any other way! Here ye go again. Giving me awesome books to read. Arrrr! I just read Danya at Fine Prints review of this book and the fact that both of you loved it bodes very well for my also loving it not to mention that the story and characters sounds fantastic. I especially appreciated your point about how Isabelle’s character is developed and that the author does a good job of showing her being awesome and not just trying to convince you that she is because they say so. Yay! Can’t wait to read this one!